In Grizzly Country, What Do You Do With a Dead Cow? To keep grizzly bears away from cattle ranches, you need a very special boneyard -- and a lot of electric fence. But the bones, and the faint odor of rotten meat, reveal the truth: we’re looking at the carcasses of up to four hundred head of livestock, slowly decomposing into compost. This heap of decaying cattle isn’t just improving the bottom lines of ranchers like Iverson – it’s also protecting a threatened species. Since 1975, Iverson has run cattle in the Blackfoot River Valley, a slice of northwestern Montana that lies on the fringe of grizzly bear country. Ranchers who share their land with grizzlies face problems that other producers don’t. For example: what do you do when livestock perishes on the range – when, say, a calf succumbs to pneumonia, or a cow dies giving birth? In bear country, dead cows can lure grizzlies onto ranches – and into potentially dangerous conflict with livestock and people. Grizzlies that hang out around humans also become menaces to themselves. This year, eight “problem bears” – animals that were deemed hazards to public safety – were euthanized in northwestern Montana, and another nine were put down in the lands around Yellowstone. Considering that just 1,500 grizzlies roam the lower 48 states, keeping bears out of trouble isn’t merely a ranching problem – it’s an important conservation issue. That’s where the woodchip piles come in. In 2003, a coalition of ranchers and landowners called the Blackfoot Challenge began working with state and federal agencies to collect and compost dead cattle. Now, when an animal dies on the property of a participating rancher in the Blackfoot River Valley or nearby Granite County, a driver stops by with a truck and carts the animal to Clearwater Junction, west of the town of Ovando, to be interred in woodchips at a bear-resistant central facility. (Carcass pickup occurs twice a week during calving season, when deaths are most frequent, and by appointment the rest of the year.) When the compost has finished cooking after sixty days, the Montana Department of Transportation uses it in highway-side revegetation projects. There have been hard-learned lessons. One weekend a few years back, a horse carcass was dropped off at the facility but not buried in woodchips, creating a beckoning aroma. Department of Transportation workers showed up on Monday morning to find a half-eaten horse – and a frantic female grizzly prowling the yard. Because she’d been shocked by the electric fences on her way into the compound, the bear was in no mood to try the fences again, and too distraught to be herded through the open gates. Finally a state biologist, armed with a tranquilizer gun, volunteered to crouch inside a bear trap and wait for the animal to run by. At last, he got a clean shot. The bear was relocated far from the compound, never to return. 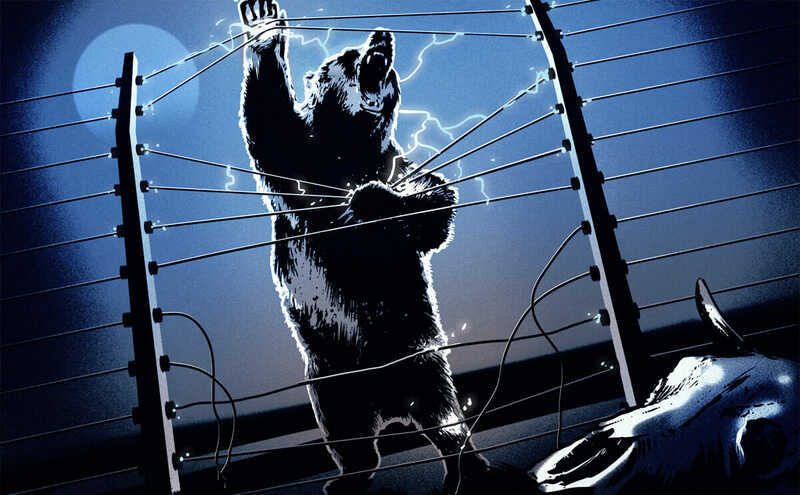 Only twice in the last ten years has a large carnivore breached an electric fence installed by the Blackfoot Challenge. Such incidents, says Wilson, are exceedingly rare: only twice in the last ten years has a large carnivore breached an electric fence installed by the Blackfoot Challenge. The group’s many initiatives – including electric fences around calving grounds, orchards, and beehives; bear-resistant garbage cans; and a network of neighbors who keep each other updated on wildlife activity – have reduced conflicts by around ninety percent. Not only does composting benefit bears and people, Wilson says it’s also cost-effective, thanks to the groups and agencies that share expenses. The US Fish and Wildlife Service provides the truck and the fuel. The Montana Department of Transportation maintains the composting facility. Jamie Jonkel, a biologist with Montana Fish, Wildlife, and Parks, picks up carcasses during the summer. Ranchers donate out of pocket. Put it all together, and the program costs only $22 per carcass – about a third of what it would without partners. This story was funded in part by a grant from the Solutions Journalism Network, a nonprofit organization dedicated to reporting on responses to social problems.